Taking the fight against cancer to festivals and concerts around the UK. The Love Hope Strength Foundation was formed in 2007 with one aim – To take the fight against cancer to new heights. 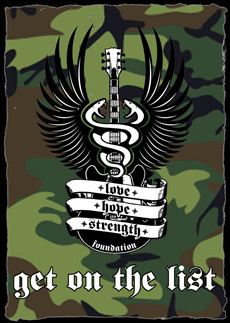 Since it’s formation the LHSF foundation has taken many prominent musicians and celebrities to some of the highest places on earth taking the message of love, hope and strength to those who do not have access to the same medical treatments, care and facilities as experienced by many of us here in the west. In 2007 we hosted the world’s highest concert on land at 18,500 feet on Mt. Everest which was witnessed by over 3 million people on the internet and by many more via the MTV commissioned documentary ‘Everest Rocks’. Events throughout the world include numerous UK fundraising treks including Snowdon, as well as to the roof of Africa at the summit of Kilimanjaro and to the land of the rising sun for a dawn concert atop Mt. Fuji, Japan. Funds raised have enabled us to install the first ever Mammography Machine at Bhaktapur Cancer Centre in Kathmandu and build a Children’s Cancer Unit in Dar Es Salaam, Tanzania and funding cancer projects within the UK. Now firmly established as the world’s leading rock and roll cancer foundation, Love Hope Strength has been endeavouring to encourage as many people as possible to sign up for both the NHS Organ and Bone Marrow Registry. Love Hope Strength promote organ and bone marrow donation. Love Hope Strength Foundation are working in partnership with NHS Blood and Transplant (NHSBT) aming to increase numbers on the NHS Organ Donor Register (ODR) and save lives. Would you take an organ if you needed one? Nearly everyone would. But only 30% of us have joined the Organ Donor Register. More than 10,000 people in the UK currently need a transplant. Of these, 1000 each year – that’s three a day – will die waiting as there are not enough organs available. Transplants are one of the most miraculous achievements of modern medicine. But they depend entirely on the generosity of donors and their families who are willing to make this life-saving or life-enhancing gift to others. One donor can save the life of several people, restore the sight of two others and improve the quality of life of many more. The more people who pledge to donate their organs and tissue after their death, the more people stand to benefit. By choosing to join the NHS Organ Donor Register you could help to make sure life goes on for many others. Joining the register records your agreement to the use of your organs and tissue for transplantation after your death. If you would like to join the Organ Donor Register please sign up at www.organdonation.nhs.uk/lhsf and get on the list and save a life. Love Hope Strength Foundation and Delete Blood Cancer UK are delighted to announce their new partnership which will be launched on The Alarm tour during March 2013. The new partnership will enable people between the ages of 17 and 55 to sign up to the stem cell donor register by filling in a form and using swabs to give some cheek cell samples for tissue analysis. A simple sign up, yet it could save a life! Someone is diagnosed with blood cancer in UK every 18 minutes, every 10 minutes blood cancer takes a life somewhere in the world. In the UK around 50% of patients never find the lifesaving match they need. To be considered a match the donor and patient must have at least eight out of 10 tissue characteristics (HLA) in common, but ideally should have 10. Delete Blood Cancer UK launched on February 19th 2013 with a single vision, to delete blood cancer by finding a donor for everyone in need of a donor, by empowering people to take action, give stem cells and save lives. Delete Blood Cancer UK is part of the DKMS family of organisations which has grown to become the world’s largest bone marrow centre. Since 2008, Love Hope Strength USA has been working in partnership with Delete Blood Cancer US, and have been undertaking donor recruitment drives at a range of cultural events through a campaign called ‘GET ON THE LIST’. So far they have recruited 30,000 potential donors to the USA register. There have been nearly 500 potentially lifesaving matches between donors and patients in need so far in those five years. We are now in a position to replicate this exciting ‘GET ON THE LIST’ campaign in the UK now. If you are unable to attend one of our donor recruitment drives, you can register on line by visiting Delete Blood Cancer UK website and make sure you tell them we sent you on the pull down enquiry list.